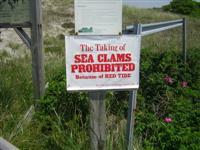 It should be a book title, but “The Taking of Sea Clams” is followed by the prosaic “prohibited because of red tide per order Board of Selectmen, Ipswich, MA.” Still, one imagines the agony and the ecstacy of the clam as it is pulled from its sea bed, pried open, and unceremoniously shucked, breaded and fried. Perhaps a sequel, The Taking of Sea Clams One Two Three? Anyway, the photos are from two trips to beaches around Ipswich on the first and third of July, during which time I was bitten by green headed flies, lightly broiled, cooled in the 58° water, and well sanded, and loved it. Enjoy. Oops—almost forgot to mention the gull. Those photos aren’t zoomed. We probably could have reached out and touched him. Next Next post: Who says college kids are getting dumber?